Nice job gpsnavigator, informative. It appears the earth has slowed its warming the past 17 years but only time will tell if this will continue. I have wondered, like NIttany mentioned, is this a cooling period for the earth that is natural but not as severe due to global warming. Time will tell. Agreed. Both great wonderful posts and good insight. By the way, warmest May on record for the globe. Nittany do you know how they get these temperatures? I read they have been doing global temperature reading since 1880. If they get it through local observations, I can't help but think the increase in urbanization has got to have an affect on the readings. I think NOAA uses satellite info and it includes ocean temperatures. Years ago we obviously couldn't use satellite. Does this have an affect on comparing observations? The land surface are observed, and they go back to 1880. Urbanization I'm sure does affect it, as it should, as it is representative of where we live. The sea surface temperatures is a reconstructed database and they also go back to around 1880. It's a mesh of satellite, buoy readings, ship readings, and sea ice cover. When data was more sparse, they used statistical methods to reconstruct and fill in the missing areas. So the full land-ocean database they use is a "merged database" from 1880-present. June according to noaa was the warmest on record in this world of ours. Meanwhile in the NYC area, we are on the way to the coolest year we have had in a long time. Isn't it amazing? Almost all of the planet is above normal, but the northeast and midwest of North America is like in this cool pocket of air. If were going to have global warming, then I want my share. Global warming is the most dangerous thing humankind has ever faced. In the 4+ billion years Earth has existed, we've never seen such warm temps. To compare long range trends, just look at the registered temp data from the 300 yrs ago, 10,000 yrs ago, 2,00,000 yrs ago, 10,000,000 yrs ago, 250,000,000 yrs. Ago etc, etc, etc,. I made a reply on the thread related to the NOAA report. I'm not going to repeat the same argument in multiple threads, but let me just say that listening to the entire video is best for getting the full context of what he says imo, regardless of what you think of his argument. As for what I think, people can refer to the thread related to the NOAA report. Brookhaven Labs on Long Island had 2014 as the first year with below normal temperatures since 1996. 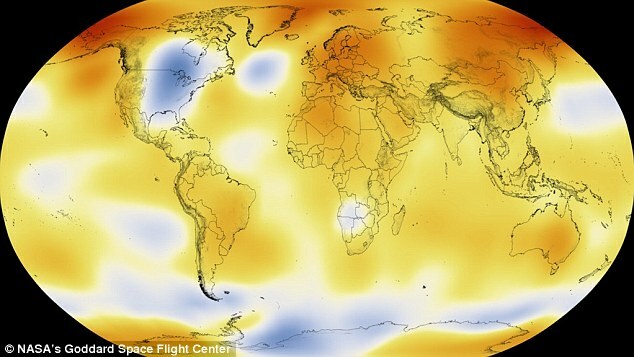 Warmest year on record for the globe. Maybe, but either way it was close. Yeah I would assume there's always margins of error for everything. Interesting to see how we were one of the only "cooler" spots on the globe. Well it's always good to see both sides. But only a 38% chance of being right? That doesn't sound overly confident to me. The 38% comes from the margin of error. It's so close to the previous record that it falls within the margin of error. I'm pretty disappointed in a few of my most conservative FB friends using recent weather events to air out their anti-global warming views,. It proves their ignorance of weather versus climate.